But what seems to be missing, and which is just as valuable, is the benefit of a mentor. Human resource manager Hanifa Jassiem said mentorship was simply about having the support you need to achieve personal goals. 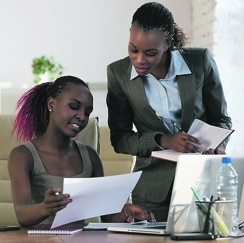 And in a broader context – and in Mzansi particularly – mentorship plays a very important role. “Many people still don’t have the luxury of a tertiary education so coaching and mentorship lets them learn skills they need. Education is fundamental to personal and professional development but this education happens not in a classroom but in real time. “Coaching and mentorship bridges the gap between knowledge and skill,” said Hanifa. She said many skills were difficult to teach from a textbook and had to be learned by action and experience. A mentor is often described as a person who guides and supports another person towards reaching their personal goals. A mentor engages their student by building trust, and adjusts their guidance according to their student’s specific needs. Ultimately, a student chooses who they recognise as their mentor, whether this person has been assigned to them in a professional capacity or not. A lot has been said on the differences between mentorship and coaching. Mentorship is likely to involve a longer relationship based on counselling rather than teaching – but it doesn’t mean a mentor can’t teach you a practical skill. The advice for those seeking mentors is to first understand what it is you need and what you expect – write them down. There is no one-size-fits-all approach. A mentor should be based on your needs. - Do they set an example that resonates with me? - Are they genuinely interested in what I am looking to achieve? - Do they listen more than speak? - Do they challenge my thinking? - Do they guide me towards finding my own solutions instead of simply giving me answers?